The salary for the position of automotive repair mechanic varies greatly not only according to age and experience but also according to sector or location. At the beginning of his career, the mechanic can start with a pay of $15/hr. The level of demand has increased. Ten years ago, customers were looking for quality technicians to add value to their technology. Today, they must be able to integrate into a team. Employers are now – and this is 50% of their choice – committed to employing personalities. To stand out, it will also be necessary to develop skills, soft skills, such as communication, teamwork. The days when the mechanic had their hands in the sludge is gone. Current vehicles are stuffed with electronics and the tools for troubleshooting and routine maintenance of engines also incorporate electronic and computer components. In a repair center, at a dealer or a garage mechanic, the mechanic, or “automotive service technician”, is often versatile: he ensures the maintenance of vehicles (tire pressure, oil changes, etc. ), repairs, quotes, etc. The automotive sector then searches for a mechanic who have specialized through their training, their internship or their professional career. And the sector searches especially for a mechanic in engine control, software development, electronic design, automation, and mechanics. An equipment manufacturer hires specialists in optics, electronics, mechatronics, system engineering or software and hardware design. However, the auto mechanic salary or the level of remuneration in the automotive sector varies greatly. Applicants who change their employer do not always experience a significant increase in their salary. Remuneration is, today, in the average of the wages of the industry. Changing mechanical components, fitting accessories, adjustments and adjustments (injection, suspension, etc.) are the mechanic’s usual interventions. The mechanic also performs systematic reviews: engine oil changes, brake controls, emission controls, etc. The mechanic’s diagnosis is primarily concerned with the control and adjustment of the engine and the connection elements. The mechanic is the privileged partner of the client, welcomes him, advises him, sells him equipment and accessories. To replace a cylinder head gasket or brake pads, the mechanic still uses his traditional tools (screwdrivers, wrenches, pliers, hammers, etc.) but cars are now stuffed with electronics (ABS braking, air conditioning,etc.) which requires IT support for failures. The automotive industry is changing rapidly with the arrival of smart cars or the need to save energy. To be the best paid, you have to be both ingenious, creative and an expert. The automobile must evolve or decline. This is controlled by a three-fold injunction: consumer demand for a connected car, the need for energy savings and the need for a car that improves the environment and safety. These trends create tension in the fields of motorization (hybrid technologies, control laws, development, etc. ), infotainment (mobile applications, software development, human-machine interfaces, etc.) and the development of mechanical products (design, testing, business management, etc.). Management is no longer the only road. Recruiters interviewed today advise mechanics to develop their career in expertise but creative and plural expertise. To be named boss and to see the amount of remunerations take off, it is essential to have a very diversified experience in the company. This is the great change of today. With lubricants, gasoline vapors and other toxic products…it is better not to be allergic. The mechanic follows the instructions of a team leader or a workshop leader. The mechanic usually works in uncomfortable positions, standing or kneeling. The mechanic can work in a repair center, at a dealer, in a branch (a garage belonging to a brand), or at an independent repairer or garage mechanic. He usually works alone or as a small team. A broken car comes in. The mechanic examines the vehicle, tests the various mechanical, electrical or electronic components, and then interprets the results obtained. Once the diagnosis is made, the mechanic dismantles the faulty components, replaces the damaged parts or rehabilitates them. Then the mechanic carries out the various adjustments and carries out the tests before the last adjustments. Once the intervention is completed, he gives the vehicle back to the customer and explains the repairs. The mechanic is responsible for prospecting, welcoming, advising and retaining a clientele of individuals or professionals. The mechanic listens, analyzes and anticipates the needs of its customers to offer the repairs, services (warranty extension, maintenance contract, etc.) and adapted products. The mechanic can be specialized according to the type of vehicle: car, truck, company vehicle. 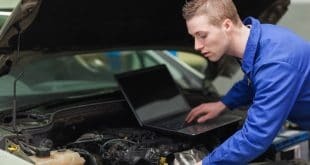 Working under the responsibility of the manager in connection with the workshop, the mechanic will have to be fluent and able to manage time well. You will also need to be available, persuasive and knowledgeable about the range of vehicles. Knowing how to listen to the client will enable you to clearly define your expectations and respond to them as best as possible. Licensed dealers and repairers are the primary employers of mechanics. The mechanic can also travel to clients. Previous How Much Does Mechanics School Cost?